A colour photograph of 1530 Dundas Street East. The Nurse Chevrolet Oldsmobile Dealership is located 1530 Dundas Street East. 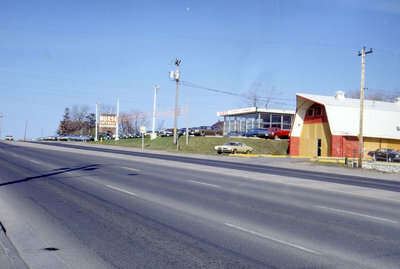 The red barn at the right side of the photograph was moved to the back of the car lot after the photograph was taken. 1530 Dundas Street East, 1969, Photographer Unknown. Whitby Archives A2013_031_001.